Rady School of Management Professor Kevin Zhu recently received a prestigious honor at the 2018 Institute for Operations Research and the Management Sciences (INFORMS) Annual Meeting. 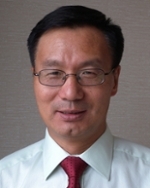 Zhu was recognized as a Distinguished Fellow of the INFORMS Information Systems Society for his outstanding intellectual contributions to the information systems discipline. Three scholars received the highest honor in the field of 3,000 scholars worldwide. The fellowship award was established to laud individuals who have conducted research that advances the information systems discipline. Award recipients are selected on the basis of penning publications that improve theory, research and practice within the discipline, serve as intellectual leaders, contribute to INFORMS journals and mentor doctoral students and young researchers. Kevin Zhu was enthusiastically nominated by a dozen of highly respected scholars from more than 10 institutions. The nomination cited Zhu’s eligibility for this award, earning more than 8,800 citations in Google Scholar with high impact. His research has been published in the top academic journals, including Management Science, Information Systems Research, IEEE, MIS Quarterly, and Marketing Science. Zhu takes pride in mentoring the next generation of leaders in the information systems discipline. Under his direction, more than 50 graduate students have completed projects exploring the impacts of next generation information technologies (cloud computing, sensors and data analytics, smart systems, block chains, and financial technologies) on how people live and work in the digital age. Several of his former doctoral students have become distinguished scholars or Deans in key institutions. As the first information systems expert at UC San Diego, Zhu has significantly expanded the wealth of knowledge on campus, instructing undergraduate, graduate and Ph.D. students, and bringing key conferences to campus. Hyoduk Shin, an associate professor at the Rady School, also recognized Zhu’s accomplishments. His contributions to the information systems field go far beyond the UC San Diego campus. As an expert thought leader in the discipline, Zhu is frequently asked to serve on panels by the U.S. National Science Foundations and European Union and give presentations at key conferences and important institutions. Over the years, he has given more than 100 presentations at top institutions around the world. Zhu received his Ph.D. from Stanford University and has been an active faculty member at the Rady School for 12 years. Throughout his tenure at the School, he has taught courses including Technology Strategy, Technology-enabled Innovation, Innovation Leadership and Digital Healthcare. In addition to providing top-quality instruction to students, Zhu continues to conduct valuable research, contributing to the fields of information systems, data analytics, e-commerce, technology innovation, and more.